Did anyone do anything fun this past weekend? I sure didn't. Yesterday I had to work and this morning my hubby came back from California. He's very happy that there are no travel plans in the near future for him. That it, for work. Going to see Megan in England doesn't count. We went out for lunch today, and that was it. I spent time in my stamp room getting ready for club on Tuesday. So glad I don't work that day because I'm not ready. Oops. Not to worry. I'll be ready with time to spare. This is one card that we will be definately making Tuesday. I totally stepped out of my comfort zone with this card. Purple is not a favorite of mine. I like it, but just don't gravitate towards it at all. And notice, I used not just one purple, but two! The base and Happy are Highland Heather and there are two strips of Gorgeous Grape. Several years ago, I wouldn't have paired any purple with green, but look how well the go together! The green is Soft Sea Foam which helps to soften the colors of the card. 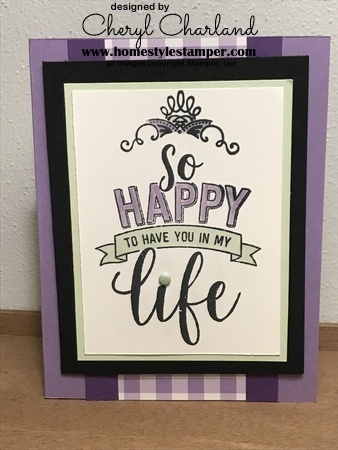 I used Stampin' Blends to color the "Happy" and the banner. If you don't have the Blends, you can always use the ink pads and blender pens. For another touch, there is a brad in in the I of Life. I've had these and never used them. What was I saving them for? Don't know. You could use a pearl if you don't have the brads. You might even be able to color the pearl with the Stampin' Blend marker. I know that work on the epoxy embellishment, so I don't see why they wouldn't work on a pearl. We will be making this card in club Tuesday. I'm always worried if they are going to like what I design for them. Don't think that will ever change.